This recipe combines two party favorites: The classic chicken wing and the margarita. Yum! Perfect for your next gathering, these wings couldn't be easier to make. Although the salty-sweet margarita marinade contains tequila and triple sec, most of the alcohol bakes off, and you’re left with a delectable dish. 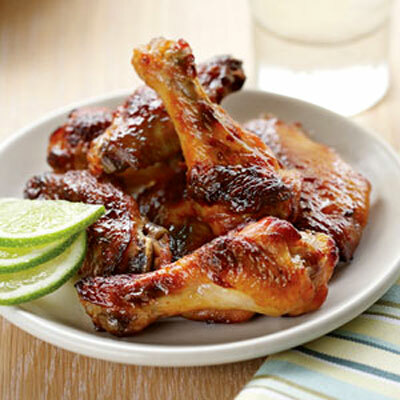 This recipe combines two party favorites: The classic chicken wing and the margarita. Yum! Perfect for your next gathering, these wings couldn't be easier to make. Although the salty-sweet margarita marinade contains tequila and triple sec, most of the alcohol bakes off, and you’re left with a delectable dish. Just marinate the wings for at least 3 hours (or overnight, if you have time), and bake for 10 minutes at 500 degrees Fahrenheit. Serve with lime wedges.